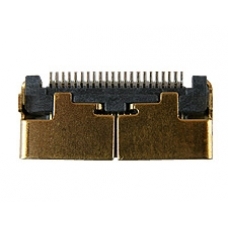 This 22 pin connector is surface mounted onto the Navman PiN 300 mainboard allowing you to charge and synchronise data with your computer. The connector is easily damaged when using poor quality aftermarket sync and charge accessories. A common symptom of 22 pin connector failure is the USB device malfunctioned message and unknown device warnings when attempting to sync the device. Replacing this component requires soldering skills. A broken 22 pin connector is typically the cause behind your Navman PiN 300 failing to sync with your PC or charge via t..